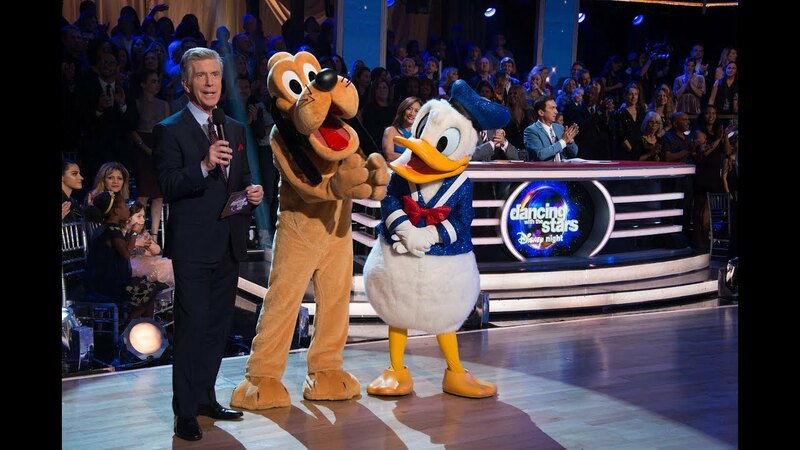 Get ready for an enchanting two-night Disney celebration on ABC, starting with Dancing with the Stars: Juniors Disney Night on SUNDAY OCTOBER 21 8|7c and culminating with Dancing with the Stars's own Disney Night episode LIVE MONDAY OCTOBER 22 8|7c. The nine remaining celebrities enter the wonderful world of Disney and make their dreams come true on the dance floor as Disney Night returns to the ballroom. The night begins with a magical opening number featuring Dancing with the Stars: Juniors host and DWTS Season 25 champ Jordan Fisher performing a song and dancing alongside the stars and pros of Season 27, plus Juniors contestants Ariana Greenblatt, Jason Maybaum, and the Juniors pros! Jordan Fisher, Ariana Greenblatt, and Jason Maybaum then return later in the show to sing "A Dream Is a Wish Your Heart Makes" from Cinderella. The night also features a performance of "Fall on Me" by Andrea Bocelli and Mateo Bocelli from Disney's upcoming film The Nutcracker and the Four Realms. And hitting the ballroom floor in style throughout the night will be Mickey Mouse, Minnie Mouse, Pluto, Goofy, Donald Duck and Daisy Duck. Each couple will perform to songs from Disney films, including Walt Disney Animation Studios' upcoming Ralph Breaks the Internet, and classic films Beauty and the Beast, Mulan, The Little Mermaid and Tangled, among others. Each couple will perform a Foxtrot, Waltz, Charleston, Jazz, Jive, Quickstep, Viennese Waltz or Contemporary dance. Don't miss your chance to watch this magical night of dancing and music LIVE MONDAY OCTOBER 22 8|7c on ABC!